Prairie Line train Photo courtesy of Twin Cities and Western Railroad Co.
Once workers at Bruce Pinske's plant in Arlington load a Minnesota Prairie Line rail car with canned vegetables they send the train on its way. "Right now the speed limit is 10 mph," Pinske says. The train slows down even more when hauling freight for another customer, according to Minnesota Prairie Line president Mark Wegner. "We slow down to seven mph for loaded ethanol trains," Wegner said. The Minnesota Prairie Line railroad runs on 94 miles of track between the southern Minnesota towns of Norwood and Hanley Falls. Each freight car can carry up to 288,000 pounds of canned vegetables or other goods. The less than blinding speed is to try to avoid what can happen when that amount of weight is on track that in some cases is 100 years old, said Rep. Terry Morrow, DFL-Mankato. "What happens with that old line is that it snaps and breaks with the larger, heavier more modern rail cars," he says. Why in the world would shippers like vegetable canning plant manager Bruce Pinske pay good money to use a slow motion railroad? "You can put three truck loads on one rail car," Pinske said. 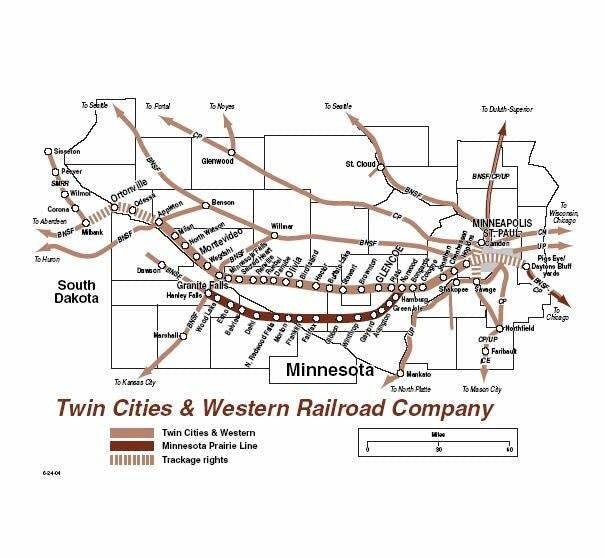 Rail service map Map courtesy of Twin Cities and Western Railroad Co.
Rail can always beat trucks on cost when it comes to hauling heavy loads over a long distance, says Pinske and other rail advocates. Once upon a time, before Minnesota's far flung road and bridge system was built, rail ruled. The state had a spiderweb-like network of rail lines carrying goods and passengers. Cheap gas and our ever-expanding road system tilted the advantage to the flexibility offered by trucks. Trucks now haul more than half the country's goods. Trains carry a bit more than a third, barges and air freight pick up the rest. Everyone agrees trucks exact a punishing toll on roads. Minnesota is chronically short on money to repair the damage. There's nothing cheap, Bruce Pinske points out, about upgrading rail, either. "It costs about $400,000 to $500,000 a mile. So we're not going to get the whole way, our goal is to get up to Winthrop," Pinske said. Here's what the owners of the Minnesota Prairie Line railroad and the counties that own the track want. They are seeking $70 million to upgrade all 94 miles of its track. Most of the money will come from other sources. Wegner justifies asking Minnesota taxpayers for $5 million by pointing to rail's advantages over trucks. "Minnesota taxpayers are saving wear and tear on their roads. They're saving on traffic congestion especially in the Twin Cities. They're saving on safety by less vehicle incidents," Wegner said. The Minnesota Prairie Line is one of nearly two dozen short line railroads in Minnesota. 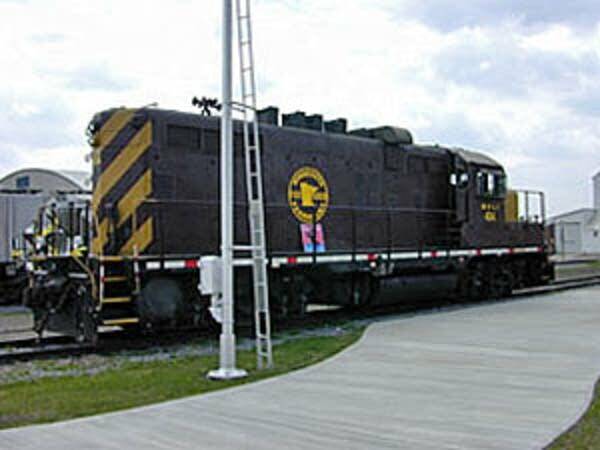 They run on rail rights-of-way once owned by dozens of regional and national railroad companies that went bankrupt years ago. Theirs is a small saga in a larger story unfolding in this country. President Obama and some members of Congress want to breathe life back into rail and that includes eliminating freight rail bottlenecks that when the economy is humming cause maddening delays. There's been lots of criticism directed at railroads for not doing more on their own to improve the rail system. But wait a minute, says transportation economist Stephen Burks of the University of Minnesota-Morris. From the railroads' point of view, it makes sense to hold off pouring billions into improving the rail system, Burks said. The railroads stand to win or lose a lot of money depending on the health of the companies whose goods they haul, he said. "Either way, you could have big changes in your actual or realized demand, and it's very hard to project that. And in the face of that uncertainty delaying investment or waiting until the value of that investment crosses a pretty high threshold can be rational," he says. Discussion of Minnesota's rail future is timely. Minnesota transportation officials are preparing a federally mandated statewide rail study. There's a public forum in Red Wing on Wednesday, and others next week in Mankato and Moorhead. People interested in sounding off on line can go to the Minnesota Department of Transportation Web page to make their views known. MnDOT rail plan writers seek public comment. The plan will provide guidance for rail initiatives and investments in the state.